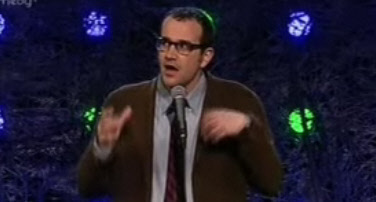 Josh Howie is a stand-up comedian from London who has been performing since 2002. You can see him live alongside other comedians at venues such as Tattershall Castle (on Victoria Embankment), Leicester Square Theatre, Crack Comedy Club and Nottingham Glee. He has his own section on Blokely called ‘Fears Of A Clown’ where you can read his funny stories. Check out this stand-up video of Josh in action, great delivery of his gags, very funny clip! You can also find him presenting ‘Indie Close Up’ on Sky Movies, which is a news show all about the world of indie cinema. Here are some quotes from the vid posted above. “I feel very secure that the holocaust could never happen in England, we just don’t have the train system for it”. “I’m not much of a political comic, the closest I’ve got is a joke about September 10th”. Image used in gallery and below is a screenshot from the clip embeded.